Arrendadora Nacional de Carros de Ferrocarril S.A. de C.V. (ANCAF) is a Railcar leasing Company, fully owned by Mexican partners. It was established in 1949 and it has been an active player of the Mexican market for more than 60 years. Currently it administrates a fleet of more than 2500 freight cars, including all types of Tank cars, as well as Covered Hopper cars, Open Hoppers, Gondolas, boxcars and flatcars. 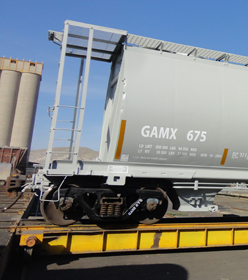 Our customer base is conformed of both Private and Public companies that require specialized railcar equipment to carry liquid or solid commodities across the Mexican Territory or in interchange throughout the United States and Canada. We also lease equipment to different railroads that require equipment to completement their fleet. We are the only Mexican Railcar leasing company, with two full service shops, strategically located and approved by the Association of American Railroads (AAR), dedicated exclusively to repair, modify, and provide general maintenance to our own fleet as well as to units owned by the railroads, private and public companies. In Gómez Palacio, Dgo., we interchange with Ferromex and in La Granja, Ver., with Ferrosur 65 miles (100 Kms.) away from Veracruz port. The capacity, efficiency and reliability of our operative systems, allow us a quick response to our clients necessities that translate directly as benefits to our customers. In ANCAF GROUP, we are committed to contribute to the integrity and improvement of the Mexican railroad system as an efficient and economic way to promote the commercial interchange.